Eating broth based soup, such as chicken noodle soup, isn’t just an old wives tale, it can actually soothe a cold. Chicken contains cysteine, an amino acid that helps thin mucus in your lungs and the hot broth is excellent for keeping your nasal passages moist, fighting inflammation in your throat and preventing dehydration. Eating a hot bowl of chicken or vegetable soup may also help to reduce congestion and stop the inflammation. The vitamin C that is found in most citrus fruits may not cure the common cold, but studies have shown that it may help to reduce the severity and the length of the common cold. Many fruits, such as lemons, oranges, limes and grapefruit contain flavonoids, which will give your immune system the boost it needs for a speedy recovery. If you aren’t feeling up to eating a piece of citrus fruit, you can still reap the benefits by simply squeezing the juice of citrus fruits into a glass of water, not only will it taste delicious, but it will help to keep you hydrated. Being congested makes it difficult to smell, taste and eat. Spicy foods can make your eyes water and nose run, which make them the perfect, natural decongestants. When you eat spicy foods, your body reacts to the burning sensation by loosening the mucus that is clogging your body, so it clears your sinuses and eustachian tube. Spicy foods will also help to improve circulation, make digestion more efficient and relieve pain, all of which are unfortunate symptoms of a cold or the flu. Some of the best spicy foods to eat while you’re sick include horseradish, chili peppers or wasabi. Ginseng is commonly used in energizing drinks as well as cold remedy medications. It contains a number of antiviral proteins, which are beneficial for fighting influenza and preventing future flu and cold symptoms. You can easily make your own ginseng beverages at home by adding dry ginseng to hot water to make a broth or add a pinch to a cup of hot, honey tea. Not only is honey deliciously sweet, but it works wonders for a sore throat. It is a natural antimicrobial, which means it kills the bacteria that is lingering on the back of your throat. Sipping on a cup of warm tea with honey will help protect your body from bacteria as well as actively target and destroy current bacterial cells. 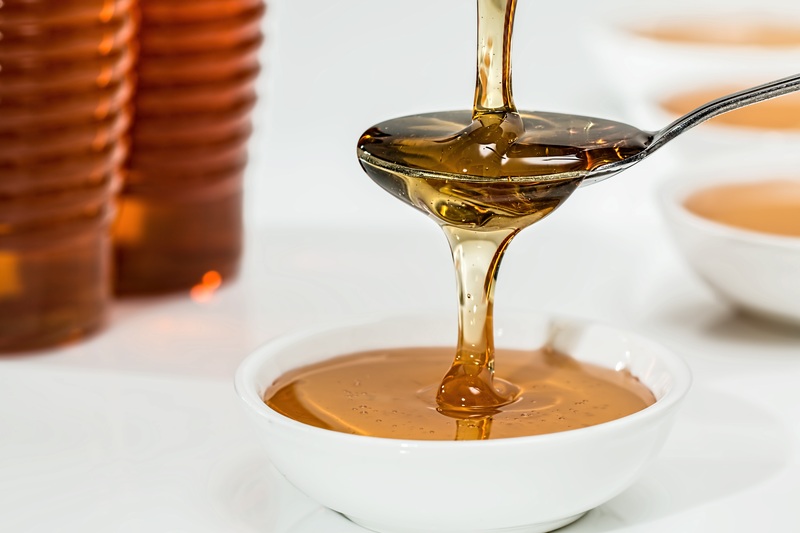 The combination of mixing honey and a warm liquid will also soothe your throat which may help to reduce coughing and itchiness in your throat. One of the most important things you need to do when sick is to stay hydrated. When you are properly hydrated, especially with a chest cold, it will help to keep mucus thin and lessen the congestion. Yes, it is better to eat whole fruit, but if that isn’t possible, the next best thing is popsicles made from fruit juice. The cold juice will also help to relieve the pain of a sore throat. It is important to only eat the ones that are made from 100% whole fruit juice. You can even make your own homemade ones, by simply freezing the juice from several fruits, such as oranges, lemons and limes. Studies have shown that ginger is amazingly effective at preventing and soothing gastric ailments, such as nausea, bloating, constipation, diarrhea and vomiting. Drinking a glass of flat ginger ale or a cup of ginger tea will help you stay hydrated while soothing your upset stomach. You can make your own tea by pouring boiled water over a few slices of ginger and honey. If you have the flu, simply sip on several cups throughout the day to soothe a sore throat, relieve stomach problems and to help keep you dehydrated. Common symptoms of the flu include sweating, vomiting and/or diarrhea, all of which can quickly lead to dehydration. Bananas are potassium-rich and easy to digest, so they can help to replenish the electrolytes you lose as a result of flu symptoms. Being sick is never fun. You feel miserable and don’t want to get out of bed, let alone spend your time in the kitchen cooking. But it is important that while you are sick to get enough nutrients and to stay hydrated. So, although you don’t have to cook a large meal, you still need to eat. Make sure you eat foods that are easily digested and will prevent or reduce the nausea, diarrhea and vomiting. In the majority of cases, a cold or the flu goes away on its own and you should start feeling better after a few days. However, if you are struggling to overcome the flu, it is important to visit your doctor to rule out any underlying health problems.